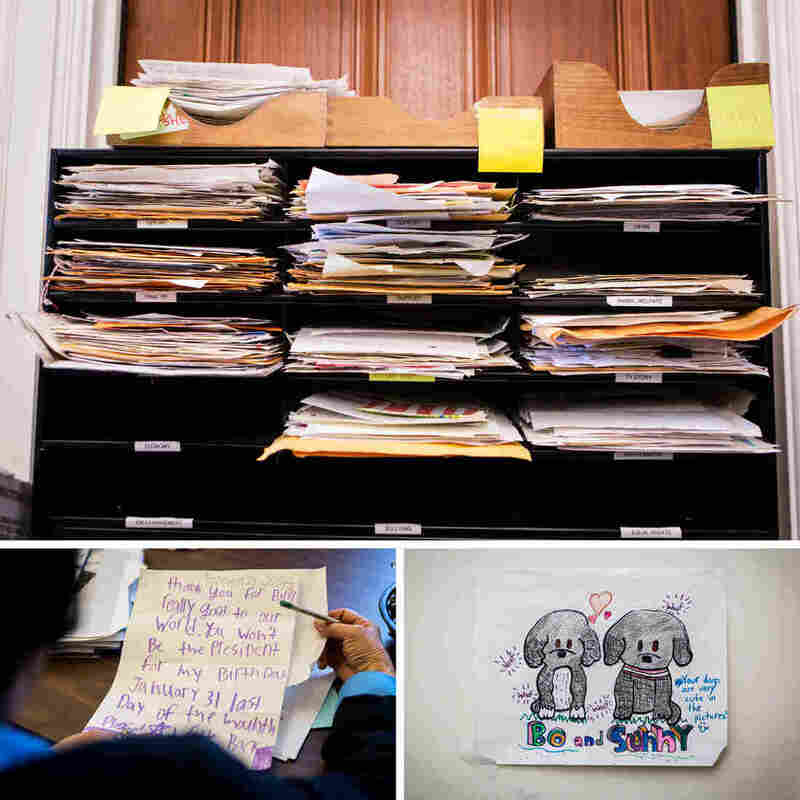 Dear Mr. President: Obama Staff Mobilizes To Answer Kids' Letters In cramped offices near the White House, a brigade of staff, volunteers and former interns is scrambling to read every letter sent to President Obama — especially the letters from children. 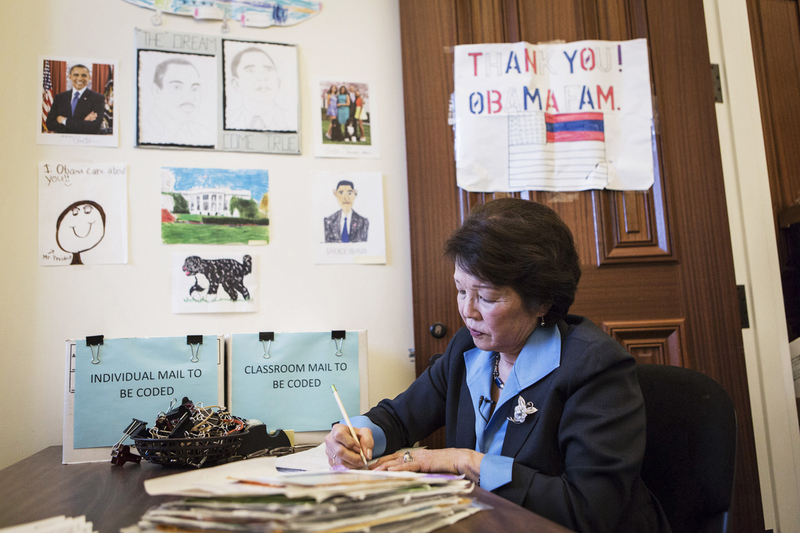 Patty Shinseki, a volunteer in the Office of Presidential Correspondence, reads letters from children to President Obama in the kids mailroom in the Eisenhower Executive Office Building in Washington, D.C. The Obama administration is rushing to tie up loose ends before packing up — protecting the rusty patched bumblebee, ending the Cuba "wet foot, dry foot" immigration policy, settling a fraud case over defective air bags and investigating police in Chicago. But in a series of cramped offices near the White House, a brigade of staff, volunteers and former interns is scrambling to read every letter sent to President Obama — especially the letters from children. And they will all get read — if not before noon on Friday, when power transfers to the Trump administration, then after, when Obama moves to new digs in the Kalorama neighborhood of Washington, D.C., says Fiona Reeves, director of presidential correspondence. "We have had a big uptick in kids writing to the president after the election, often in the vein of farewell letters, or reflective letters," Reeves says. "Or for older kids, 'I've grown up with you.' "
In a small room in the Eisenhower Executive Office Building, mail from children is read, sorted into categories and answered by staff â except for the few that are sent every week to President Obama. The letters are eventually stored at the National Archives and will later find a home in the president's library. The office gets about 700 letters a day, Reeves says. The team reads and sorts each by subject and picks out those they think the president should read. Obama gets 10 letters at the end of each weekday he's at the White House, and each week a few of those are from children. He'll continue to get those 10 letters until he leaves, Reeves says. "We are hustling ... but I think we will actually end up packing up some of the letters that we haven't read through with the president, and he'll maintain a small team to work through his correspondence," she says. Some are personal and give the president a chance to dole out some tough love. Like the girl who wrote to complain that her parents wouldn't let her get her nose pierced. "She felt it was her right as an American, land of the free," Reeves recalls. "And he wrote back, 'This will be your right some day. This is not your right, at the moment.' "
In another of Reeves' favorites, a girl tells Obama she's having trouble making friends. His response: Be kind and generous, and find an art or sport you like to meet people with common interests. "But don't worry," he wrote. "You'll have a lot of friends in your life, and I'm one of them now." 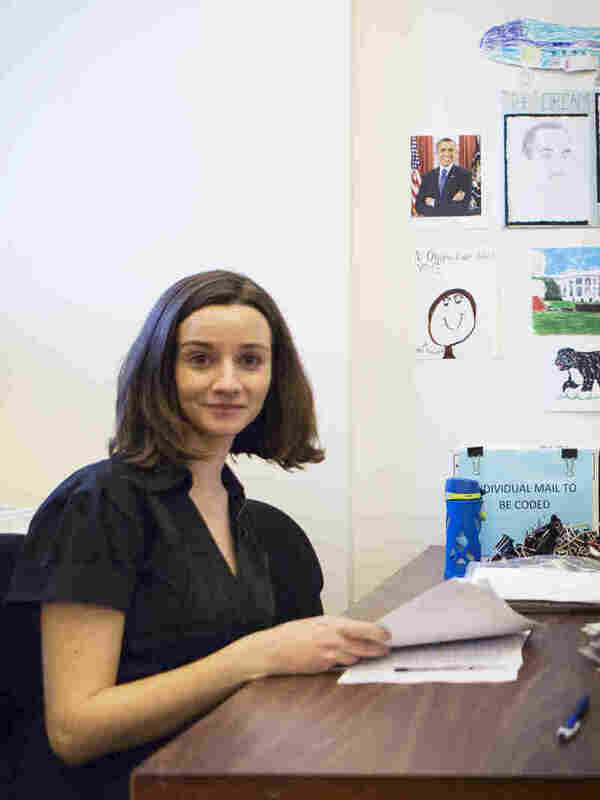 Fiona Reeves, director of presidential correspondence at the White House, sorts through mail in the kids mailroom at the Eisenhower Executive Office Building in Washington, D.C.
Reeves says Obama has relished the father-in-chief role. "There are so many other things to deal with when you're the president," Reeves says. "The idea that this little girl says 'How can I help make a friend,' and he sits down and says, 'Oh, you know, it's good you asked ...' "
But the president doesn't always get lofty in his answers, she adds. Sometimes, "It wasn't so much, 'Dream big dreams,' it was, 'Don't let the bullies get you down.' "
Many recent letters suggest ways for Obama to spend his retirement. "He could be their basketball coach, or another one said, 'Come and be my dad's golf coach' or 'Come and be my nanny,' " says volunteer Patty Shinseki. "But they all have wonderful advice for the president." Children also write with their problems, says volunteer Michael R. Moore — health issues, homelessness, immigration status or families breaking up. Many are sent to other offices for followup, Moore says. "You have to be tough" as a reader, he says, because the stories can be heartbreaking. "Kids are amazing. They deal with stuff that would really bring you down in life, and they're writing about it to the president." Reeves and her staff say they get as much from the letters as the writers do from their responses. One boy, for instance, who sent a photo of himself in a shirt embellished in puffy paint, conveyed an inadvertent lesson in citizenship. "I know it must be hard to leave the White House right now," Reeves reads from the boy's letter. "But you should know there are a lot of kids who think like me, and we're getting a little older every day." "He was saying, 'I'm a part of a country where people like me can help shape the direction we move in,' " she explains. "It's really cool to see from a little kid who still uses puffy paint."